Marketing technology is a bridge that enables marketers to create, nurture, enhance, automate, and measure consumers’ brand interactions. Savvy marketing leaders are adopting innovative marketing technology (or “MarTech”) solutions to understand how people move through the entire customer lifecycle. Much of marketing in the digital age is centred on using this technology to access and analyse big data. This data is collected through consumer interactions and engagements to form predictions about future behaviours. Knowledge of the customer is a top priority for marketing professionals and marketing organisations. The challenges marketers face in terms of customer knowledge are often tied to customer data that isn’t integrated or unified. Reaching your customers across the multitude of digital touchpoints that exist is difficult to achieve when your data lives within separate point solutions across your organisation. Marketing has evolved into a customer-centric discipline, which places the individual customers at the heart of marketing design and delivery. Marketers need to utilise their data in the interest of their customer, as a way to maintain customer loyalty. Customers have different behaviours and preferences, meaning that customer-centric marketing needs to start catering to the individual. As a customer-centric marketer you are always working towards gaining a 360-degree view of your customer and their journey with your business. Synthesising these rich insights about individual customers is only possible with a unified data set, at the center of an optimized and integrated MarTech stack. Do You Have A MarTech Stack Or Just A Stack Of Marketing Technology? MarTech tools are often SaaS platforms that offer a variety of solutions like marketing automation, social media engagement, AdTech, content management systems, analytics tools, and others. These MarTech tools span the following core categories: Automation, Advertising, Content, Analytics and Reporting. These numerous, often non-integrated tools collect and store data about each customer across different teams and departments. The data is at risk of becoming fragmented, leading to fragmented marketing. Which in turn makes marketers struggle to obtain a 360-degree view of each individual prospect or customer. Data silos prevent organisations from delivering a consistent, holistic customer experience. We have known data silos are bad for the last 30 years, yet we are still just talking about them! To quote Cyfe, “Data silos exist separately; without sharing, cross-referencing, interpreting, adding to each other’s self-contained data sets”. There are many reasons for these data silos, however, we all agree that if you control your data you control your business’ future. They exist because separate business units within a company collect data for a particular purpose. This does not lend well to the sharing of data. For example: a typical marketing department will have specific individuals or teams using different platforms for each marketing objective. These separate teams will have ownership over the data being aggregated by “their” tool. This often results in a siloed data view. If each piece of the marketing puzzle is assigned its own MarTech solution, it will become harder and harder to integrate all that data. Any established company that has gone through various leaders, philosophies and acquisitions will experience incompatible systems. As companies grow over time and as leadership roles change, vendors’ relationships can change too. Sometimes that growth can come in the form of acquisitions. The organisations involved have not only completely different philosophies, but also different system. There is also the potential for an overlap in vendor service providers. Typically, these systems are incompatible, can’t communicate and can become obsolete. The result is more siloed data and a cumbersome workflow. Making matters even more challenging, the marketing technology landscape is rapidly evolving and becoming saturated. 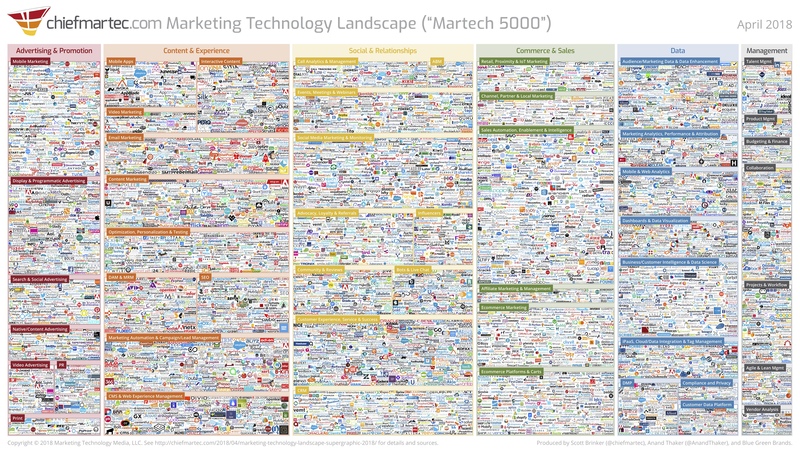 This image (see below) from Chief Martech demonstrates the 6,829 martech vendors available. With the amount of MarTech vendors available, businesses have a much higher chance of falling victim to data silos within each single platform or tool. To ensure the flow of data is flawless, you need to go beyond the marketing technology platforms. Everything has to come together like a well-oiled machine, which requires all the working parts to be in perfect working order. This happens when you successfully merge all fragmented data sources into one central place. Previously siloed data sets will be able to communicate with each other for the first time. This type of convergence holds the potential to unlock breakthroughs that weren’t previously accessible, including an unrivalled level of customer centricity. Marketers’ frustration over disconnected customer data, and eagerness over unifying it, has inspired a new set of MarTech solutions: Customer Data Platforms (or CDPs). CDPs centralise data collection, unify customer profiles from disparate sources, create and manage segments, and activate those segments in priority channels. The CDP is both the foundation for data-driven, and customer-centric, marketing. It has comprehensive data, making a single customer view possible. Marketers are able to draw on first-, second-, and third-party customer data when planning and executing marketing efforts. From the customer’s perspective, this means more meaningful, relevant, and timely touchpoints throughout the customer journey. When evaluating the CDP marketing place, marketing leaders should gain an understanding of how the CDP ingests data and how it integrates with your internal and external data sources. This will help you determine whether you just need a CDP solution or a marketing cloud with an underlying CDP, depending on the current execution platforms in place. Don’t let your MarTech stack become the source of fragmented data. Focus on data strategy rather than technology platforms, bringing all your data together to uncover everything there is to know about your (prospective) customers. The end goal is to create a single profile of a customer with a 360-degree view of their brand interactions. By aligning deep customer insights with communications and operational processes, a company can drive sustainable results and become truly-customer centric.